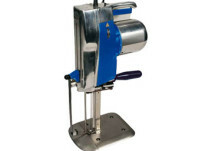 Straight-knife machine for manual cutting of multi-ply fabrics or leather. Reliable, fast and easy to use. Simple and secure operations. Our cutters, either with rotating or with straight blades, are both an ideal choice for any kind of cutting. From sample to multiple layers cutting, they are suitable for all flexible materials, such as textiles, knitwear, technical textiles and special materials, such as foil, felt, soft leather, etc.